Marianne Boesky Gallery is pleased to premiere artist Sue de Beer’s sixth major film, The White Wolf. The film uses the classic werewolf narrative as a lens through which to explore broader themes of transformation, memory, and the psychology and physicality that form our sense of self. The low-budget horror-thriller was developed as part of de Beer’s John Simon Guggenheim Fellowship, which she received in 2016, with additional support from Mana Contemporary. On view June 21 – August 3, 2018 at the gallery’s 507 W. 24th Street location, the exhibition will also feature a group of de Beer’s early career, horror-inspired photographs, which informed portions of the new film. The film, which is set on a fictional island off the coast of New England in the late 1980s, follows the intersecting experiences of several characters connected through a medical clinic, to a secret history shared by inhabitants of the town. Presented as a non-linear, two-channel installation, The White Wolf fuses the elements characteristic of the werewolf genre with a lyrical examination of the body and its relationship to the ephemeral sense of self. 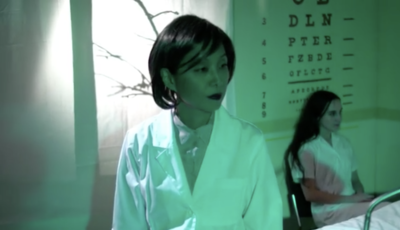 This dynamic counter-play is best exemplified in the lead character—a reclusive doctor who heads the clinic—played by New York-based experimental musician and composer Yuka Honda. Her quiet but confident presence defines the voice and tone of the film. The film embodies de Beer’s trademark style of editing, which uses techniques such as persistence of vision, duplication, and reflection. These approaches, along with her signature non-linear narrative structures, allow de Beer to infuse her stories with image-making and the physical presence of the film itself. Her use of colored light, glass lenses, and quiet attention to the luminosity of the figures that perform for her camera bring the viewer more deeply into her fictional realms. In The White Wolf, de Beer also incorporates dance sequences, performed by McManus and Blakely White-McGuire of the Martha Graham Dance Company and by Honda’s bandmate, the tap dancer, Kazu Kumagai, to further relate the themes of the film. For The White Wolf, de Beer also returns to handmade sets and spaces for the first time since the completion of her film, The Ghost (2011). This re-engagement with the hand-built also inspired a wider review of her early work, including a selection of photographs shot between 1998 and 2001. A selection of these images, which are inspired by the type of graphic imagery associated with horror, will be included in the exhibition to underscore the trajectory of de Beer’s practice and relationship to this genre. As part of the development of the film, de Beer spent several months working at Mana Contemporary in Jersey City, NJ creating the projections and constructing the environs that would become the medical clinic, home interiors, and island views seen in the film. In keeping with prior presentations of her work, the colors and textures of the film will be brought into the gallery space to more fully transport viewers into the world of the characters.